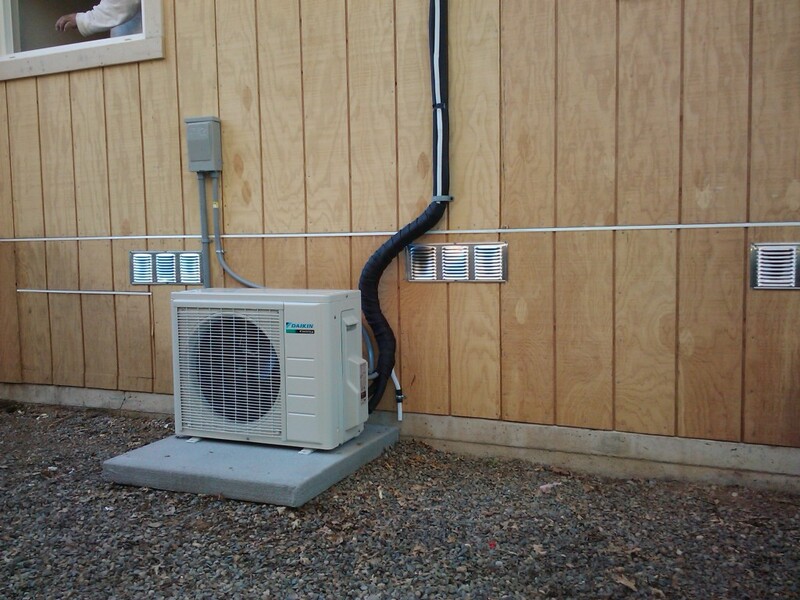 Ductless, mini-split heat pumps offer so many advantages over conventional heating air systems that they are quickly getting the attention of Sacramento Valley home and business owners. Featuring excellent energy efficiency, super quiet operation and quick installation almost anywhere, these units are the ideal choice for any space that demands comfort. Since they require no costly, cumbersome, and inefficient ducting, they can be installed just about anywhere their is power. They are perfect for entire homes and offices and conference rooms, as well as sun rooms, master bedrooms, family rooms, garages, shops or just about anywhere else you need affordable heating and cooling. 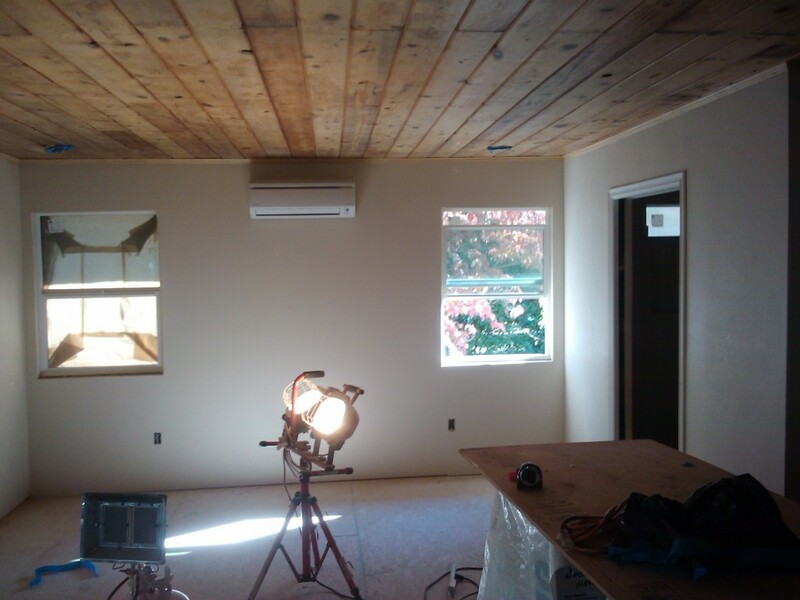 Recently a customer contacted us to design and install a ductless heat pump system for their new, 600 SF master bedroom addition to their Sacramento home. They had contacted several companies that install traditional forced air systems, and found that adding on to their existing system was going to require a new air unit and a maze of expensive duct work to get conditioned air into their new space. 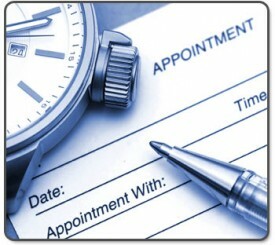 Also the modifications would require expensive California Title 24 testing and compliance. In addition the customer was adding additional load to a system that they already could barely afford to run in the summer heat of Sacramento. 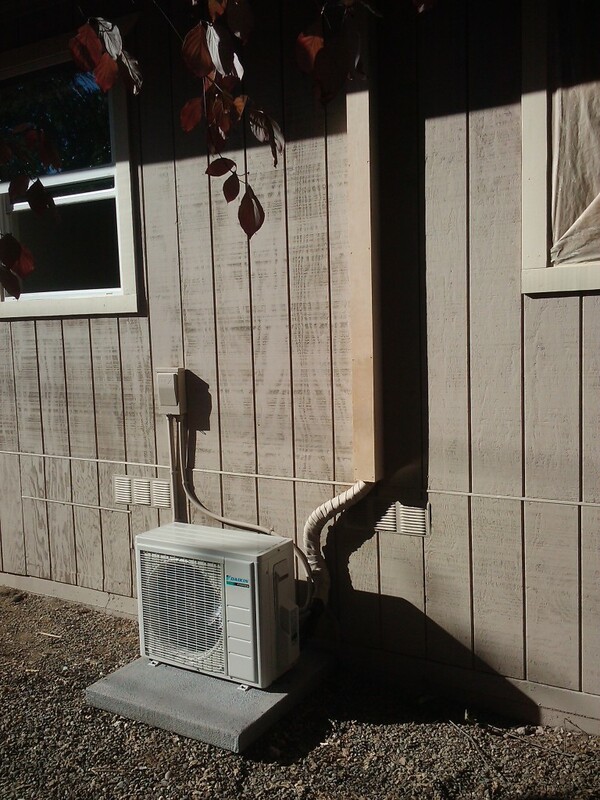 Nice clean install of Daikin Heat Pump Exterior Unit On Sacramento Master Bedroom Addition. 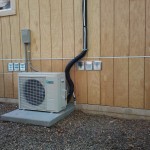 Notice the small black bundle of line set and cabling that connects the outdoor unit to the indoor one. Unit shown before line set covers. Nice clean install of Daikin Heat Pump Exterior Unit On Sacramento Master Bedroom Addition. Unit shown after line set covers. Which was then connected, via a small bundle of line set and cabling, to the indoor evaporator unit. No expensive or messy ducting to install! Daikin indoor unit provides quiet, inexpensive heating and cooling, and blends seamlessly and unobtrusively in homeowner’s space. The unit blends in seamlessly, and unobtrusively with the space and the homeowner is enjoying, highly efficient, year round comfort. In addition the unit is so whisper quiet its sound is almost imperceptible and with the included remote, they are able to precisely control the unit right from their bed! The best part though, according to the homeowner, is “the unit saved us over $5,000 dollars in installation costs to install ducting to our addition, as well as thousands more for upgrades to our existing system so it would meet current energy standards”. If you have an addition, garage, shop, master bedroom, family room, sun room or any other space where you want year energy efficient, year round comfort please contact us for a free consultation today. Ductless Warehouse feature sales, service, installation, and free energy efficiency consultations for ductless heat pumps. I have a sun room on my home in Sacramento. It is way too hot too in the summer. Will one of these units work okay there? A ductless heat pump would be better than okay. These units are excellent for sun rooms. They provide cooling comfort in the summer and as an added bonus, heat in the winter.